What Are The Best Stall Guards For Horses? Horses are roaming animals, so the confines of a stable is an unnatural environment for them. However, there will almost certainly be times where your horse HAS to be stabled, either because of illness, to let the grass rest, or just because your livery rules demand that they be kept in at some point. 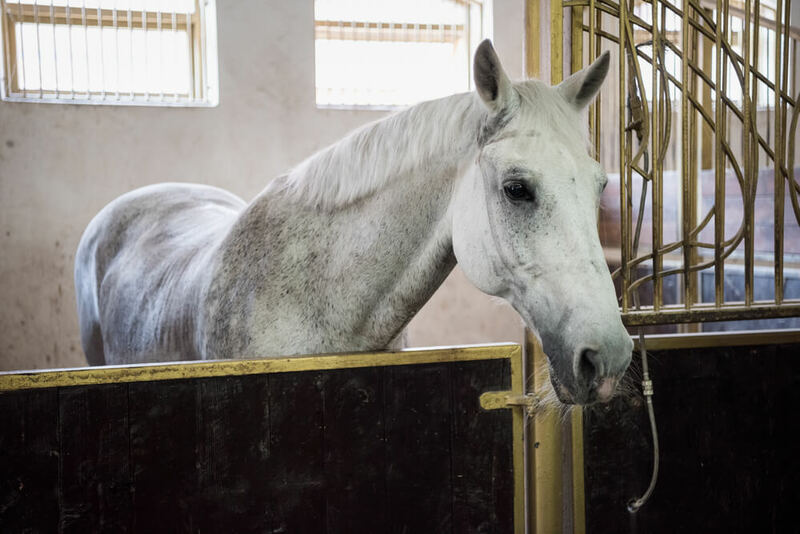 There is lots you can do to make your horse’s stabled times a more pleasant experience for him – treat balls, toys, and of course stall guards. Stall guards keep your horse securely where he’s meant to be, and allow the flow of air into the stable from the aisles. Stall guards can also calm nervous horses who don’t like being confined, as they are less restrictive than a fully closed stable door. Where do you find the best stall guard for horses? We have selected three choice candidates for the best stall guard for horses, so just have a look through the below and choose the one that suits you. This is an attractive and functional stall guard that will quickly become a favourite of both you and your horse. It is made from high quality materials and rigorously tested to make sure it’s as strong and durable as it can be. Very strong materials used in the fabrication – Textilene mesh bordered with 3” nylon webbing makes this a very strong, secure stall guard. Comes with all the necessary hardware – This stall guard comes with all the attachments you will need to fix it to the stable doorway, including heavy duty D-rings, double ended snaps and a screw eye for attaching to the stable. 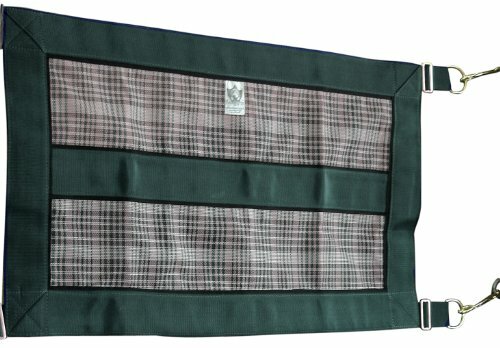 It’s a very pretty design – Although the look of the stall guard isn’t at the forefront of your mind when shopping for something to keep your horse in his stable, it’s nice to be able to shop for an attractive one! Quality assurance for peace of mind – This product is heat tested, tear tested, and just about everything else tested, to make sure it is as strong and well made as it can possibly be. It can stand up to just about anything your horse throws at it! D rings may need replacing – It has been suggested that occasionally the D-rings may give under excess pressure from a determined horse. Kensington is a well known, trusted brand that have been making horse products for many years, and horse owners the world over know and love their products. This stall guard reflects their strong brand image. This is a minimalist-looking stall guard, but one which is highly functional and good at its job. It’s great for the horse who likes to be able to see out at his surroundings and not feel penned in. Easily adjustable for different sized doorways – This stall guard can be easily made wider or narrower by simply adjusting the straps. It is extremely strong and durable – The webbing straps are made of a material that is like a seat belt in a car, so it is designed to be tough and non breakable under sudden or sustained pressure. Very heavy duty snaps – For extra peace of mind, the snaps which hold the stall guard closed are extra strong, meaning that there is no way even the most determined horse can break through. Comes in a functional color for stables – As we all know, anything to do with your horse is probably going to get pretty mucky quite quickly. This stall guard is in plain black, so you know that it won’t show the dirt! The gaps between the mesh are large enough to fit a head through – If you have a very curious horse then a non mesh stall guard may be better, or you may come to the stable to find he has poked his head through the holes and got stuck! A well made, strong stall guard which will keep your horse safe and secure and let him see out at the same time, this one is ideal for any stable. Pessoa is a well known horse equipment brand, so you know that anything made by this company is bound to be of high quality and fit for purpose. Strong and well made – This stall guard is made from the same 1200D fabric as Pessoa rugs are made from, so it is designed to be hardy and rugged. It looks really pretty! 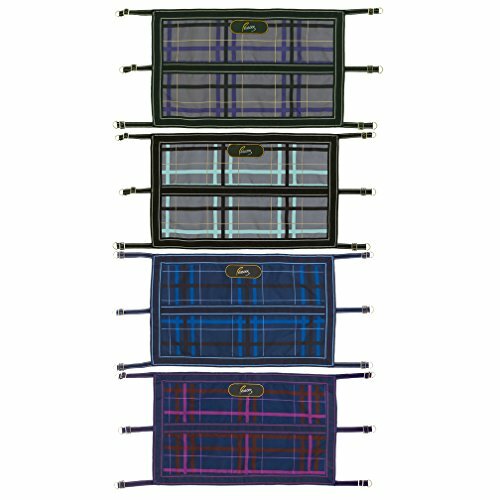 For those who like an attractive stable this stall guard is a must – it comes in a very nice navy and black tartan effect. Incredibly strong under pressure – Even with the weight of a 1,000 pound horse leaning on it, this stall guard will not break easily, saving you money and frustration. Width can be adjusted to fit different sized doorways – Don’t worry if you have an unusual sized stable door, this one can be made to fit any gap. It doesn’t come with any hardware – You will have to supply your own means of attaching this stall guard to the stall doorway. You can’t go wrong with a good, functional product from a well known brand – a fact which is borne out by this great stall guard from Pessoa. It will not only keep your horse in but will brighten up your stable too! A good stall guard is a must for keeping your horses safe and secure. Stall guards can also be used quickly and easily to block of parts of the barn if a horse gets loose, and helps keep everybody safe. There are so many to choose from; will you opt for webbing? A full covering? Half or full size? Pretty colors or plain black? The choice is yours; just have a look through these products until you find the best stall guard for horses – and for you!